Luscious knows you want to tell your Valentine that they’re the hot fudge on your Dairy Queen Peanut Buster Parfait, the triple axle in your ice skating routine, and the mosh pit of your thrash metal show. Say it with homemade cookies. 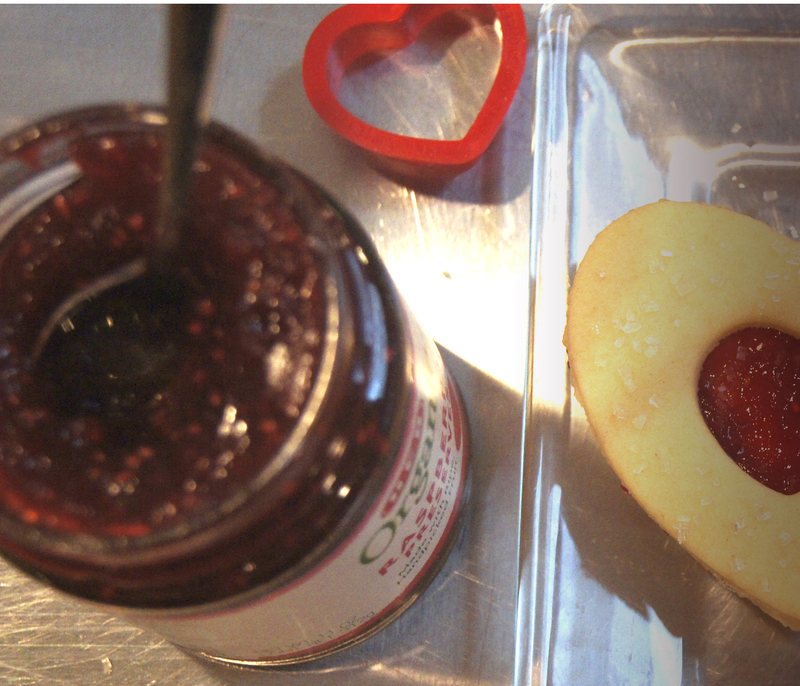 These pretty treats are an easy Valentine’s gift for your sweetheart, and so delicious, of course. The cream cheese makes a flavorful, manageable dough that you can roll and cut at lightening speed. You’ll need a pair of heart-shaped cookie cutters (two sizes) to make a traditional valentine’s cookie. If you are not traditional, then user any shape cookie cutter you like– star, bunny, Slayer logo — whatever you think says Be My Valentine. Beat together butter, cream cheese, and sugar until fluffy. Beat in orange zest, egg, baking powder, salt, and extract until well mixed. Stir in flour. Divide dough into 2 or 3 large balls, flatten each into a disk and wrap with plastic wrap. Breaking the dough into sections makes the size more manageable for rolling, and also you can keep dough sections cool in the fridge while you work with one section at a time. Place dough disks in the fridge for 30 minutes so that the dough is firm enough to cut. You can refrigerate the dough for up to a week, just place on the counter for a few minutes before rolling so that it’s pliable (but still cool and firm). Preheat oven to 350º and grease cookie sheets. Roll out dough on a floured surface to a thickness of about 3/8″. Cut with the larger heart cutter, re-roll scraps and continue cutting. Then use the smaller cutter to cut windows in the center of half of your hearts. 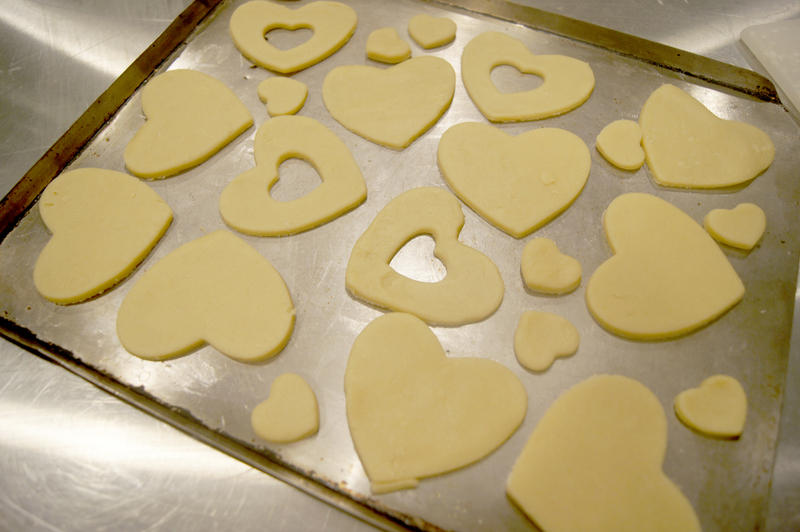 Place all hearts, large and small on the cookie sheet and bake until lightly browned, about 9-10 minutes. Allow cookies to cool. Brush the window-cut large hearts and half of the small hearts lightly with liqueur, and sprinkle with white sparkling sugar. Go with black sparkling sugar if making Slayer cookies. Spread about a tsp of raspberry jam on the unsprinkled cookies. Place a sprinkled cookie on top, sprinkles up, to make a pretty sandwich cookie. Repeat with the small hearts. Use any flavor jam or preserves you prefer, but we’d suggest red plum for the Slayer version because it looks EXACTLY like freshly congealed blood. Don’t ask how we know that.